It’s always nice to report back with a thrilling story of a stellar catch after a long day on the water. This afternoon, Alan & his buddy Stan joined Captain Paul and me aboard the Lady Pamela II in search of the daytime Broadbill Swordfish. Alan, nor Stan, had ever caught a Swordfish and left the dock lookin' for a fight. Lately, Daytime and Nighttime Swordfishing has been hit or miss and I explained to our anxious anglers that we have to be patient out there and wait for the bite. When we reached our destination of 1,800 ft we dropped ‘er down and watched the rod. Our first bite of the day was a big one. It pulled some serious line and offered a ten minute tease before it released itself into the big blue. After that, Alan and Stan got a taste and wanted more. It wasn’t long before our second bite. Within 10 minutes of our fresh squid sitting on the bottom we had a monster gnawing on the other end of the line. A long and exciting hour and forty five minutes passed before we even saw a silhouette of the 500 lb’er. 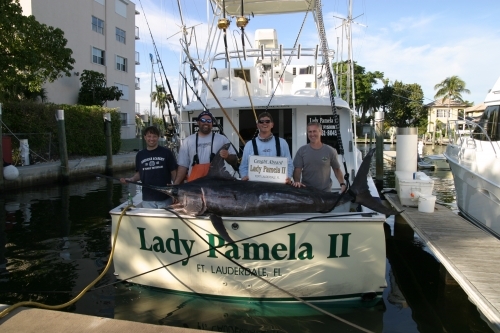 Alan and Stan got more than they could’ve imagined while Daytime Swordfishing in Fort Lauderdale, Florida. We ended the day with one last bite that got away.